For marketers who wish to extend or strengthen their marketing efforts in the UK, Blue Mail Media’s UK Business Email Database can make this job easy for you. Considering the tough competition that persists in most industries across the UK, your sales and marketing team will only be as good as your marketing database. 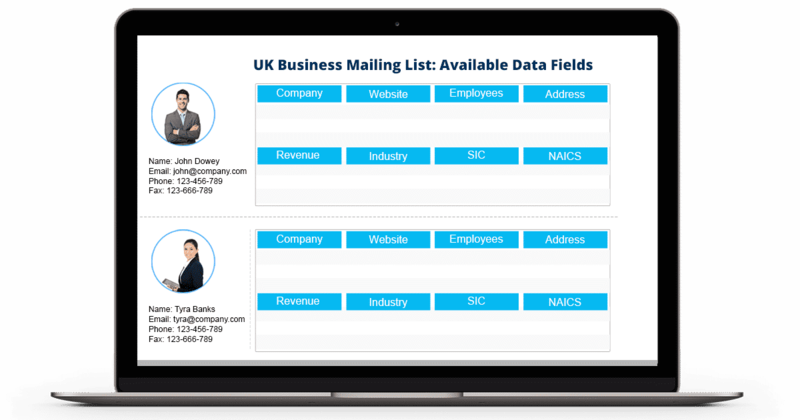 Blue Mail Media’s UK Business Executives Email Database has been designed to give your multi-channel marketing campaigns a boost. It gives you complete access to marketing information you may require communicating with highly influential decision makers, business executives and professionals across the UK via telephone, email or mail. Blue Mail Media adheres to industry best standards to maintain and enhance the quality of our databases. Our team of marketing specialists, data scientists, and other professionals follow a stringent process to collect data, verify data, and update the same on a timely basis to maintain high data accuracy at all times. This is why, our UK Business Mailing List can be your strategic resource in helping you gain impressive response rate, greater conversions and higher returns on investment. To give more flexibility to marketers, we provide pre-packaged as well as customized list of Email Addresses of UK Business Executives that aligns perfectly with your campaign specific goals. Blue Mail Media enjoys a widespread presence across North America, USA, UK, Africa, APAC and other major regions of the world which allow us to serve clients in a global yet local way. For more information, call us today! 1. How accurate and reliable is your UK Business Email List? - Our UK Business Email List is 85-90% of accurate and gives you more than 90% deliverability. Our team of data specialists verifies and updates the data in our email list every 90 days to maintain its accurateness. 2. Do you offer any customization option for UK Business Email List? - Yes. We provide our UK Business List in both prepackaged and customized format to meet your business requirements. You can customize the data in our email list based on various selects such as SIC code, NAICS code, geographical location, job title, company’s revenue and other. 3. Can I use UK Business Mailing List to target the businesses worldwide? - Yes. You can use our UK Business Mailing List to reach all the top-notch decision makers and executives across the globe. The places we cover are - the US, the UK, North America, Canada, Europe, Australia, Middle East, South Africa, Asia, and many more. 4. Do you rely on any trustworthy data sources for UK Business Email List? - Yes. We have a team of data analysts who collect the data for our list from highly authentic sources such as government records, job portals, newsletters, yellow pages, surveys, business directories, trade exhibitions, conferences, events, corporate websites, meetings, and many more. 5. What are the information’s I get from your UK Business Email Data? - We give you access to all the essential marketing information once you avail our UK Business Email Database. The data includes- first name, last name, company, job title, revenue, company size, phone number, geographical location, web address, SIC code, NAICS code, and more. 6. Does your UK Business List comply with GDPR and Anti-Spam law? - Yes. Our UK Business Email List strictly follows all the guidelines of GDPR and Anti-Spam law. So, you don't have to bother about its legitimacy. 7. In which format do I get my UK Business Mailing List? - After you make the payment for our UK Business Email List, we will email you the list in Microsoft Excel format.